On November 5, 2018, we launched our policy paper, “Ensuring Quality Care For All Seniors”. Most Canadians will rely on seniors care at some point in their lives. Our public health care system is currently ill-equipped to address the health care needs of the aging population. We need a National Seniors Care Strategy to ensure that all seniors can access quality care, regardless of where they live in Canada. This strategy must ensure consistent funding, standards of care and staffing levels across the country. All Canadians deserve to age with dignity and respect. We believe Day’s contradictory statements show that he has been double-billing, and that he wants the freedom to continue doing so. Day launched this law suit to defend himself from prosecution. In the process, he is threatening the future of public health care in Canada. Blood plasma is the first body part that has been allowed for sale in Canada. Paid plasma donations are threatening the safety and sustainability of Canada’s blood supply.·Quebec, Ontario, Alberta and B.C. have banned payment for blood and plasma donations. A federal bill to ban paid blood and plasma across the country is now before the Standing Committee on Social Affairs, Science and Technology. The CHC participated in a lobby day on Parliament Hill on October 30th to raise awareness among Senators and Members of Parliament about this important legislation. Learn more about this issue and show your support for voluntary blood donations here. Over 80 national, provincial and territorial organizations agree·that Canada needs a single-payer pharmacare plan that is universal, public, accessible, comprehensive and portable. It’s wonderful to have consensus among pharmacare advocates about the principles that must underpin this important new national program. We would like to thank everyone who took the time to participate in the federal government’s consultation on pharmacare over the summer! We expect the Advisory Council report to be released in the spring. Everyone is invited to join us for a dynamic discussion with leading researchers on building an inclusive and pro-public health movement for all. RSVP and more details here. CHC Board Member Keith Newman wrote about the economics of pharmacare in the opinion piece “National pharmacare simply makes cents”, which was published in the summer edition of Ottawa Life Magazine. Meet those responsible for the CHC’s great work. 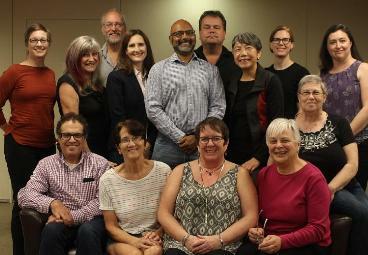 From left to right, at the back:·Melanie Benard, CHC’s new National Director of Policy and Advocacy;·Pat Van Horne, United Steelworkers;·Keith Newman, CURC;·Professor Vanessa Gruben, University of Ottawa;·Anil Naidoo, NUPGE;·Andy Savela, Unifor;·Elizabeth Kwan, Canadian Labour Congress;·Amanda Vyce, CUPE;·Kathy Stewart, accountant;·Amélie Baillargeon, National Director of Operations and Projects. At the front:·Fernando Reis, UFCW;·Julie White, Secretary (CURC);·Pauline Worsfold, Chair (CFNU);·Dr. Michele Brill-Edwards. Missing from the picture:·Sandra Azocar, Friends of Medicare;·Rita Morbia, Treasurer (Inter Pares);·Morna Ballantyne, PSAC;·Andrea Furlong, Council of Canadians;·Linda McLaren, United Church of Canada;·Professor Pat Armstrong;·Dr. Joel Lexchin.